Mask fragments are key items in Sekiro: Shadows Die Twice. 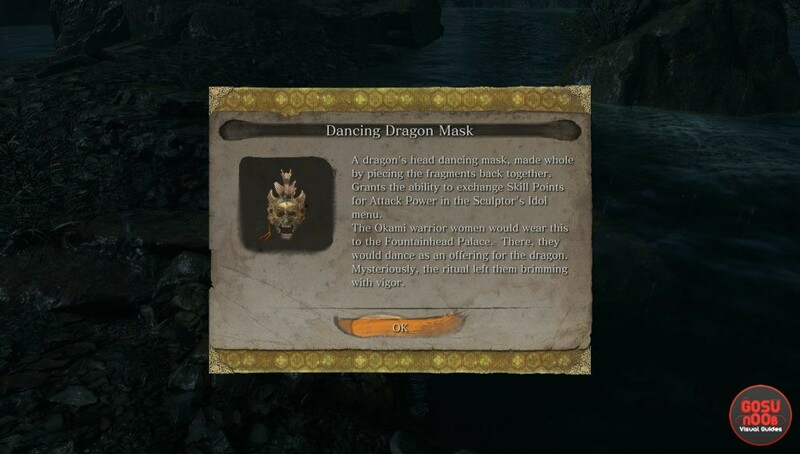 There are three of them, and when you’ve collected them all, you can put them together to form the Dancing Dragon Mask. The mask will allow you to exchange skill points for attack power, which makes it a great late game tool. In this guide, we’re going to show you all Sekiro mask fragment locations, to help you obtain it. You can buy the first mask fragment from the Pot Noble Harunaga. He’s the merchant that lives in a pot, and you can find him in the Hirata Estate area. Spawn at the Estate Path idol, climb over the gate and follow the river bank to the left. You’ll reach a couple of boats shortly. If you look across the river, you’ll see some rocks and reeds in the water. Swim there and you’ll find Harunaga a blue pot, his slender hand reaching out. You’ll need 7 scales to buy this mask fragment, and if you’re having trouble finding them, check out our treasure carp scale locations guide. The dragon mask fragment is also for sale. This time, you’ll have to look for one of the Memorial Mob merchants. It’s the one in the Abandoned Dungeon, right next to the idol at the entrance. He’ll ask for 5000 sen in exchange for his mask piece. The last piece is property of the Pot Noble Koremori. You’ll find him at the Fountainhead Palace, and he even has his own idol, called Near Pot Noble. To get there, simply spawn at the Flower Viewing Stage idol, and make your way to the cliff on your left. It’s a pretty straightforward journey. Once you reach him, he’ll offer to sell you his mask fragment for 12 carp scales.